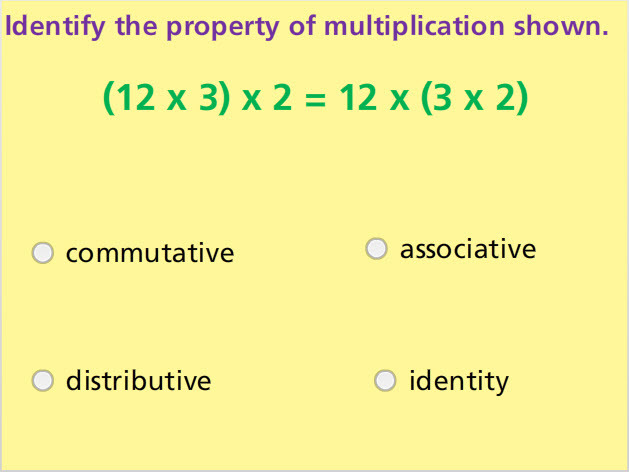 Identify the property of multiplication represented by an equation in this interactive online math test. This test has seven multiple choice questions and three drag-and-drop activities. Understand the rules that apply to the commutative property, associative property, distributive property, and the identity property of multiplication. Use the properties of multiplication to solve for an unknown number in an equation. Return from this Properties of Multiplication Math Test to the Elementary Math Tests, 5th Grade Math Tests webpage, or to Math Tests.